A man speaking on a Web posting is believed to be Abu Musab al-Zarqawi talking about the Jordan bombings. (CNN) -- A man believed to be Abu Musab al-Zarqawi, the Jordanian-born leader of al Qaeda in Iraq, said the terror group did not target Jordanian civilians in the November 9 hotel bombings that killed 59 people. The statement, delivered on an audio tape, contradicts a televised confession by a woman in custody thought to be a fourth bomber that she and her husband intended to detonate their explosive belts at a Jordanian wedding party. At least 10 friends and relatives of the bride and groom were killed. He also dismisses evidence that one of the bombers purposely blew himself up amid the crowded wedding party as "baseless lies fabricated by the evil Jordanian intelligence services." The bomber could have detonated his bomb above the wedding party, "unintentionally" causing the ceiling to collapse, the speaker said. "Oh, our people in Jordan, what do we have to do with explosions amidst wedding celebrations? If we wanted to blow up our bombs in such places, be mindful that wedding halls are all over the country, open to everyone with no guards or security risk." The audio statement, which cannot be independently verified by CNN, was posted on a Web site frequently used by al Qaeda in Iraq. The speaker's voice has a strong resemblance to that of al-Zarqawi. U.S. officials said the CIA is conducting a technical analysis of the audiotape, comparing it with known recordings of al-Zarqawi. The speaker says the terror group targeted the Radisson, the Days Inn and the Grand Hyatt hotels in Amman after two months of intelligence gathering. The hotels were targeted because they housed U.S. Embassy officials as well as Israeli tourists and U.S., Iraqi and Israeli intelligence agents, he said. Four Americans were among those killed in the blasts. Most of the victims were attending the wedding party at the Radisson Hotel. The person on the tape said Amman was a target because the Jordanian government has served as "the protectors of the sons of Zion." He also said the Jordanians were culpable "for shooting the mujahedeen in the back as they go to perform Jihad." However, in condemning the country's ties to the West, the speaker also said "no one cares for you and your blood more than us" and that "you are more beloved to us than our children and ourselves." "We know that you are the victims of this criminal regime who murdered your children just like they did to the Muslims in the (Jordanian) city of Maan, violating the honor of your women and forcing you to taste humiliation and defeat," he said. Jordanians backed their king's words with action, marching through the streets of Amman and chanting, "Burn in hell, Abu Musab al-Zarqawi!" Conversely, many Jordanians said privately they wouldn't believe al-Zarqawi was behind the attacks until they heard him claim responsibility. The speaker called King Abdullah an infidel and a traitor and accused him of providing a "backyard base for logistical support for the American army" operating in Iraq. Wednesday's bombings were the worst terror attack in Jordan's history. They were not the first time al Qaeda has targeted Jordan, but most of the attempted attacks in the past have been thwarted. 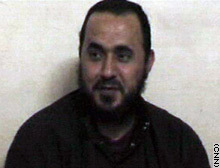 In April 2004, a person claiming to be al-Zarqawi claimed credit for the bombing of the United Nations headquarters in Baghdad on August 19, 2003. The attack killed 22 civilians, including the U.N.'s chief envoy to Iraq, Sergio Vieira de Mello. He also is a suspect in the bombing of the Jordanian Embassy in Baghdad two weeks earlier that killed at least 16 people. Jordan and the United States suspect al-Zarqawi of planning the death of U.S. diplomat Laurence Foley, who was killed in October 2002 in Amman. A Jordanian court convicted him in absentia of planning to bomb tourist hotels during millennium celebrations.